So Many Bike Lights, What Bike Lights Do You Like? 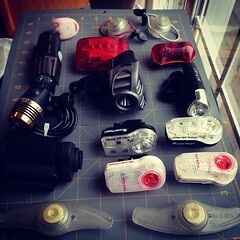 Over my years of cycling I have accumulated many different bicycle lights. Everything from the small little blinkies to some heavy duty, from wheel side lights to rechargeable lights. I would recommend almost all of these, especially the Planet Bike Superflash and Turbo rear lights. Angel has recently gotten a new front light to replace her clunky Light & Motion Vega 120. She got the CygoLite Expilion 400. First thoughts: it looks to be really well built and extremely powerful, I might get one myself. Everyone needs a good bicycle light if they plan to ride at night. 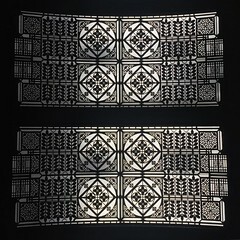 It’s nice to have extras to pair lights for the best setup, or as backups and lend them to friends. Stay safe when you ride your bike, use good lights. These are the bicycle lights I have, but there are many more lights out there to choose from. 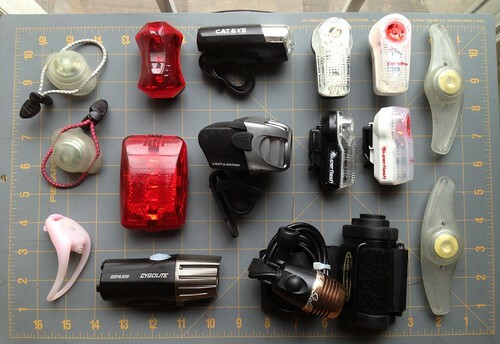 What bicycle lights do you have, like, or would like to use? I will write review for most of these coming soon. * Indicates the lights are to help you see the roadway, not just to be seen. 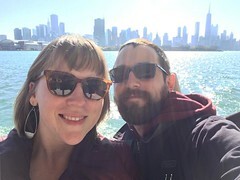 This entry was posted in BIKE, Reviews and tagged bicycle, bike, review. Bookmark the permalink. I try not to buy more than what I need. Right now I use my dyno hub light (great for foggy morn commutes to work on Fern Ridge Path), in conjuction with my Planet Bike Blaze and I always use my Black Diamond headlamp on my helmet (need a non-fixed light for cornering and spotting potholes). rear light came with bike…powered/recharged/wired to dymohub thru frame/fender. I usually keep rear light on all the time. I frequently use a little freebie blinky on back of helmet or clothing. I havent seen the movie yet, but hear it’s great. I bought all the maps from ACA and rode part of the route from Eureka, MT to Seely Lake when I was there in 2010. I really want to do all the Canada/MT/WY portions someday. I followed several bloggers when they rode it last year. Snow pack for the last 2 yrs has required a late start or a lot of pushing. hope this yr will be better for the riders. Eugene Public Library has it if you don’t have Netflix. I have Planet Bike Superflash on the back in strobe pattern and an old 5 LED Vista blinker permanently attached to my milk crate. I have had motorists roll down their windows at night and thank me for having “”a rear bike tail llight I can see way down the road” I use the Planet Bike Sport Spot on the front in flashing mode as I am most concerned in letting people know I’m approaching and have good night vision, it is easy to switch and lights up the road nicely if needed. I work nights and ride a lot in the dark, my biggest problem is with bicyclists with way too much big battery pack systems, they often blind me when they go by.